Boohoo has teamed up with the charity Style for Stroke to create a limited collection of slogan tees for both men and women. Perfect staples for this summer’s festival season, they retail at £12 each, with around 25% of overall profits going directly to support the charity. So while you’re looking stylish, you can also rest assured that you’re doing your part in supporting a great cause too. With slogans like "I am who I am," where did the inspiration for these words come from? Boohoo teamed up with a selection of celebrities, from Kelly Osbourne to members of the hit reality TV show Made in Chelsea, who were asked to divulge which words they’d most like to be remembered for — hence the name of the range was born: Famous Last Words. The collaboration combines a great mixture of influential celebrities and inspiri ng words that can hopefully help to raise awareness about strokes amongst young people. 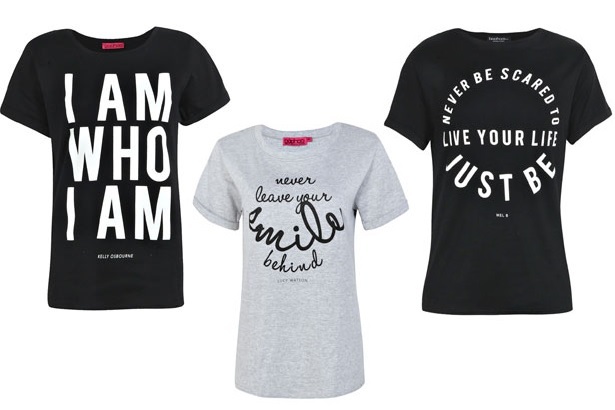 Be inspired by the celebrities’ famous last words yourself, and peruse the limited-edition collection over at Boohoo.com.